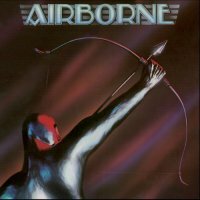 One of America's best kept secrets, multi-talented quintet Airborne released just this one album, but perhaps these days are more well-known for what the individuals went on to do than the classy, old-school pomp/AOR contained on this disc. Started by keyboardist/guitarist/vocalist Beau Hill and guitarist/vocalist David Zychek, the duo soon found multi-instrumentalist and singer Larry Stewart and completed the line-up with session bassist John Pierce and drummer Mike Baird, the fledgling band soon scoring a deal with Columbia and releasing their album in 1979. Produced by the great Keith Olsen (a friend and constant source of inspiration to Hill since his teens), the mix of Styx, Boston and Foreigner was irresistible, with huge harmonies, clever arrangements and memorable choruses all over the shop. The soaring pomp of 'The Lady Knows Best', 'Feel Like Lovin'' and 'Ghost Of Love' get the album off to a great start, whilst the poppy 'That's Where My Love Goes' and straight hard rocker 'Optimystical' define the boundaries of the band's material. At their best they were breathtaking, like the big ballad 'No Exception To The Rule', which has one of the best string sections ever recorded on a rock album, the glorious 'Life In The City' with its edgy guitars, or the thumping 'Stand Up'. My personal favourite is 'Soldier Of Fortune', which has a classic intro, great guitar playing, sublime keys and more high vocal harmonies than an entire Bee Gees album. Despite Dave Reynolds' sleeve essay relaying the usual story of a band sabotaged by the politics of a record label having a major staff upheaval, I think the band had three very good singers but no truly great ones in the Gramm, Perry or Delp class. Still, Beau Hill went on to produce multi-platinum albums for the likes of Ratt, Warrant and Winger, David Zychek worked with Steve Miller and Eddie Money, Larry Stewart had played with Jerry Lee Lewis and has since become a minister, John Pierce was a member of Pablo Cruise and appeared with Boz Scaggs and Richard Marx, whilst drummer Mike Baird was another busy sessioneer and had spells with Journey, Rick Springfield and Van Stephenson. Airborne is a timely reminder of what can happen when talented people get together.